As I mentioned about a month ago, one thing I want to focus on as my blogging ramps up is to write about what goes on behind the scenes in preparation for the Bugeater. This could satisfy the curiosity of some folks, but hopefully it can also serve as a resource for anyone interested in running a larger 2 day event like the Bugeater. 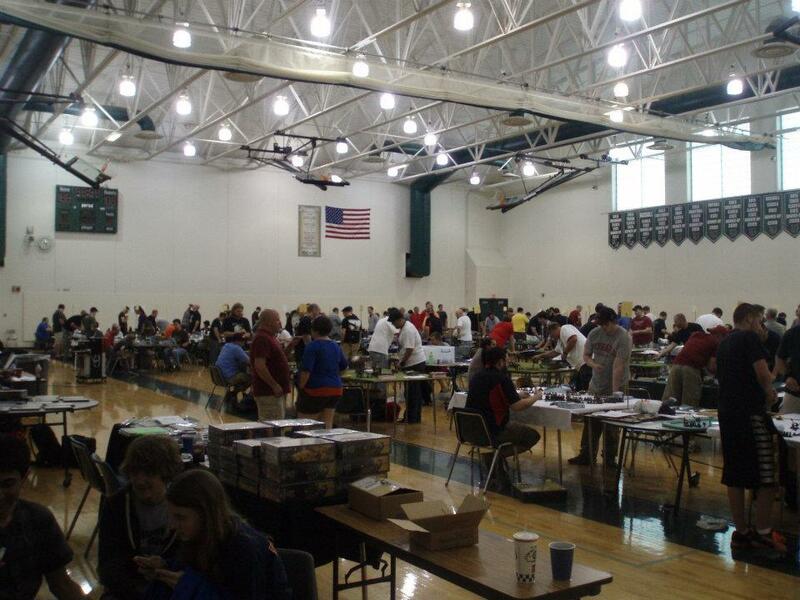 These posts coincide with the fact that we’ve reached a good “holding pattern” for our event: two years ago we got the event off the ground, and this past year we expanded our field to 64 for 40k and 48 for fantasy. Next year I want to stick with those numbers, and simply work on improving our product. I feel pretty strongly that our external product – the one the attendees get on that weekend in June – is a strong one. There are still some issues we’re going to work on, but my big push this year is to improve on the behind the scenes infrastructure of the tournament. Recruit more people to help to reduce burnout of the tournament staff, increase the amount of materials (tables, covers, terrain) that we own and aren’t borrowing, etc. I’m also looking to streamline the operation, define what everyone’s roles are, and generally make it more efficient. To do that, I tried to record as much of what I did this time around to make sure I didn’t forget it. I learned this year that running a GT is almost like the way my 2 year old daughter feels about going to the doctor. On the way, she’s super excited and wants to talk to the nurses and all of that … and then she gets into the exam room and remembers what has to get done. I kind of felt like that this year – super excited, but I forgot all of the little things that were required for the event to run smoothly. After this year – that won’t happen again! Facilities. I don’t have to worry about that because we send a few thousand to the debate program and get the school’s gyms for free, but the Bugeater is the exception to the rule. If we had to go through a hotel or some other facility we either a) wouldn’t have swag bags / as many prizes or b) would be charging way more than the $52. This is by far the biggest operational cost. Start up material. We are extremely lucky that there are three guys in Omaha with great terrain that let us use their stuff: Andyman, Russ, and Terrain Dave. We’re now looking at gradually building up our own terrain stockpile to get completely loan free (which you’ll notice Adepticon did and the NOVA Open is currently doing). If you don’t have someone or several individuals that can provide that kind of terrain support, get ready to start producing terrain at least nine months out. You want to give yourself and your crew time. I’d recommend reading Mike Brandt’s posts on what his crew has been doing. A Catch-22: Staff and getting attendees. If you play in a medium sized city like Omaha, you’re going to run into an interesting dilemma: you need your locals to play in your event to prop up the player base (and rep your gaming club while you TO the event! ), but you also need quality people on your tournament staff. Hopefully you have the local guys who judge and run a variety of events that can jump on board your event crew, but odds are you’ll have to lose some of your better players if you want to have quality judging. You’ll also need locals to help transport, setup, and tear down. With custodians moving in 2/3 of the tables (we had to get the rest from classrooms), it took our crew of 10-11 guys a little under three hours to get stuff set up this year. Get organized early: You should be planning a year away from the event. The problem is, many things won’t actually happen until you get much closer to the event … but you have to be ready and know those events are coming. Case in point: many companies that could potentially sponsor your event won’t consider it until the event is a few months out, or at least until you have a sizable number of paid attendees that you can disclose – particularly in the first year of the event. You should be building a timeline and be cognizant of when those events will unfold. And have back up plans. This year, because of change in staff on their ends, I lost sponsorships from Games Workshop, Black Library, and Forgeworld. The loss of Black Library and Forgeworld just meant less raffled off prizes, but the loss of GW meant I had to come up with an alternative for the prizes given out to the award winners. One thing you could do that would really help your GT in the long term is to find some weekends to test run your rules/scenarios/comp packs. Our gaming group runs one fantasy 3-round tournament and one 40k 3 round tournament: the March Hare in the spring (fantasy), and the Khornehusker in the fall (40k). These events predate the Bugeater, but we use them to test our scenarios and make sure there are no major hiccups. Testing in a live tournament setting is really important to ironing out kinks. It is also a good way to make sure your perspecitve matches those of the potential GT attendee. We tested the fantasy tarot card system out at the March Hare, and after solid player feedback we knew we would want to implement it. That’s all for now, and in my opinion a short but fairly accurate summary of the big four issues that you should be concerned about. In the next post I’ll share the Bugeater’s financials, offer some perspective on our planning process, and go into particular detail on our timeline for our 40k primer pack. With sixth ed right around the corner, things are going to get interesting! Posted in GT Info, Warhammer, Warhammer 40k and tagged bugeater gt, tournaments, Warhammer, warhammer 40k. This is great! I’m looking to start my own tournament next year and this will be a great resource.